My corned beef: a less appetizing shade of grey, but still just as delicious. I need to get my bloggy self back into gear! Please excuse the hiatus! I’ve been churning out stories for KLCC in Eugene and preparing to teach community college again. Thankfully, today I got to return to my passion for food with a KBOO special St. Paddy’s Day episode on corned beef. Two excellent guests joined us for the discussion. Ken Gordon, of Kenny & Zuke’s Delicatessen, joined us in-studio, and food writer (and Portland native) Matthew Amster-Burton called in from Seattle. His new Spilled Milk podcast recently addressed this topic. We even got to indulge in luscious corned beef and rye sandwiches on-air. We’ll post the audio soon. To prepare for the show, I brined my own brisket to make my first corned beef ever. I got a small 2lb. brisket from Deck Family Farms through Corvallis Local Foods. For the brine, I used the recipe Matthew Amster-Burton recommended. But I didn’t have the hours to slow-braise he called for. 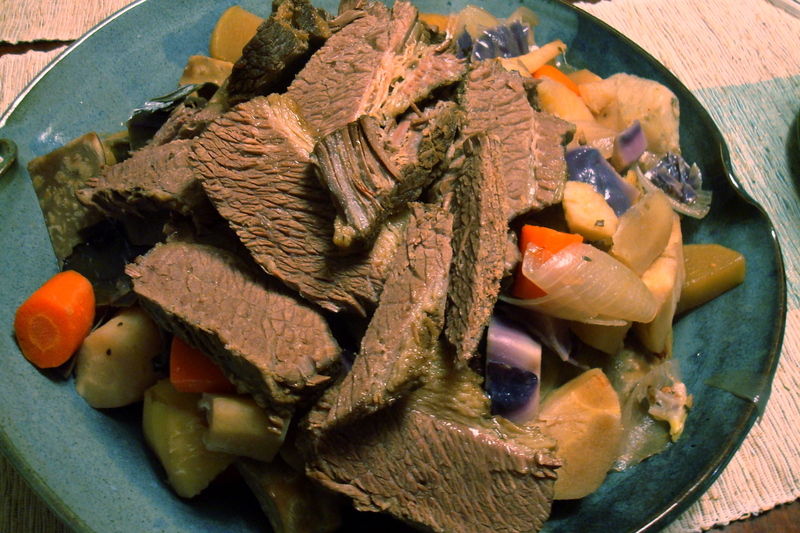 So I boiled it in stout and then added tons of root vegetables (potatoes, parsnips, carrots, celeriac and rutabaga) and cabbage and onions, as The Oregonian recommended. The tender sliced brisket was delicious with Weinsteiger horseradish mustard and the freshly ground prepared horseradish my friend Rebecka made. I hope corning my own brisket becomes an annual tradition. I love how effortless curing and fermenting is. Maximum taste from just slathering on a salt/spice rub and letting it sit. Interesting- is it brown because of the cooking? 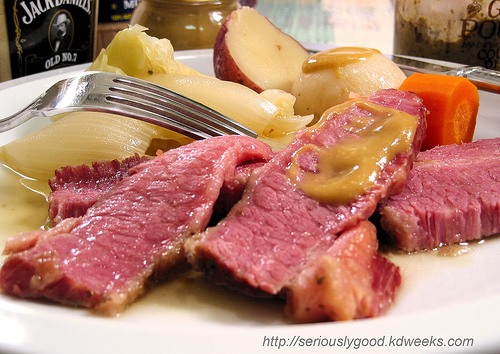 Is pink corned beef pickeled instead of cooked? This makes me want a reuben sandwich!